From Faith — Yes, this will be on my Thanksgiving table but I’ll make it for any reason. No one can resist this fresh raw salad, and if you have a food processor, it comes together so fast, and can be prepared several hours ahead. (Add the truffle oil just before serving.) No formal recipe needed here. 1. 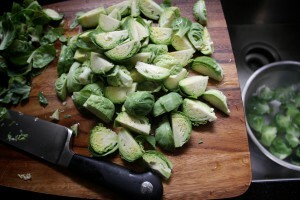 Wash a box or bag of Brussels sprouts and throw them in the food processor until they are shredded fine. Place them in a large bowl. Now put chunks of Parmigiana-Reggiano in the processor and grate until fine. Place in bowl with shredded sprouts. Squeeze in fresh lemon juice. Add salt and pepper. Stir until well mixed. Taste and adjust lemon, cheese or salt and pepper to taste. This can be covered and stored in the refrigerator for several hours. 2. Let the salad come to near room temperature for 15 minutes before serving. Drizzle on truffle oil and mix. Taste to add a little more if needed. It should taste like an equal amount of truffle and cheese with a hint of lemon freshness. Trust me, you can do this; it’s easy! Note: A small box of Brussels sprouts serves four people once shredded, but there’s nothing wrong with leftovers. Hi Faith — could you turn this into an actual recipe (with measured amounts of Brussels sprouts and cheese to start out with) for non-cooks like me? It sounds so delicious but I can’t imagine how much I’d need to have an equal taste of cheese and truffle (and what the proportion of those ingredients to the Brussels sprouts would be). Thanks! What kind of truffle oil do you use? This is amazing! There’s a restaurant near me that makes this and I’m so glad I found your recipe! Thank u!